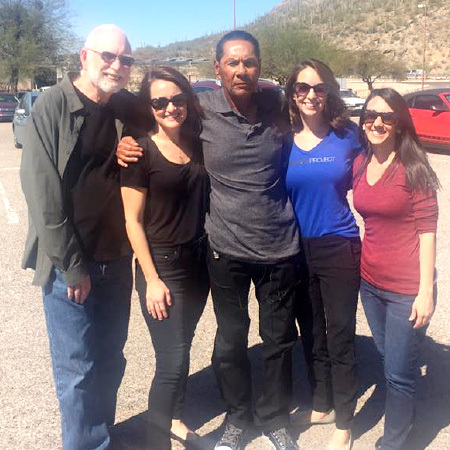 Tucson, AZ – This morning Eddie Collins returned home to his family after serving more than 43 years in prison. Collins, who has been a Justice Project client for 12 years, was serving time for a 1973 felony murder conviction. Collins’ brother was the actual shooter and, pursuant to a plea agreement, served only 10 years for the crime. Collins was convicted under Arizona’s 1956 criminal code which made him ineligible for parole. The Justice Project worked with the Pima County Conviction Integrity Unit in an effort to correct a manifest injustice. Prosecutor Rick Unklesbay, head of the Unit, reviewed the case and agreed to a re-sentencing for Collins which made Collins parole eligible and gave him an opportunity to return home. Justice Project attorneys Katie Puzauskas and Kindra Helferich and University of Arizona law professor Andy Silverman represented Collins at his parole hearings. Mr. Collins will be living with his sister, who has remained at the core of his support group for over four decades. We are thrilled that Mr. Collins is finally returning home. Since 1998, The Arizona Justice Project has been working to prevent and overturn wrongful convictions in the State of Arizona. The Arizona Justice Project has launched legal clinics at the ASU and UofA law schools where law students review and investigate claims of wrongful conviction. The Arizona Justice Project receives approximately 350 new requests for help each year from Arizona inmates. The small staff and dedicated volunteers provide the last resource for many people seeking relief from a wrongful conviction or a manifest injustice.